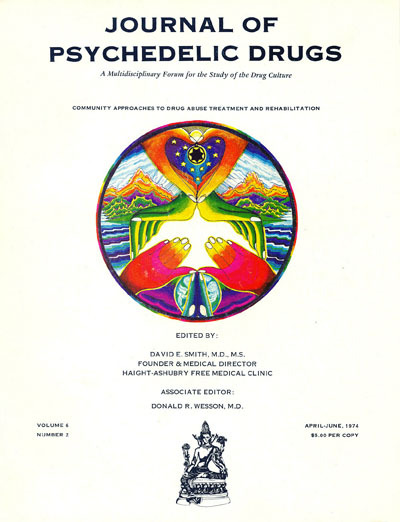 In the summer of 1967 a new periodical appeared �to compile and disseminate objective information relative to the various types of drugs used in the Haight-Ashbury subculture.� Conceived and edited by David E. Smith, M.D., the Journal of Psychedelic Drugs, which began as a house organ for the Haight-Ashbury Free Medical Clinic of San Francisco, found its geographical focus rapidly expanding as the use of psychedelics and other psychoactive drugs (especially LSD and marijuana) spread throughout the nation and around the world. The Journal's topical focus shifted also, reflecting the replacement of the Haight-Ashbury district�s hippie subculture and its use of psychedelic drugs with a scene predominated by high-dose intravenous amphetamine users, who either burned out or turned to the use of other drugs, such as barbiturates and heroin, in an effort to ameliorate the speedy effects of the stimulants. Similar patterns of drug abuse began to appear in other urban centers as well. Hundreds of free clinics, hotlines and drug information/education centers emerged to provide this largely youthful population with confidential, credible and nonjudgmental services, which at that time were unavailable from traditional medical, social service, and mental health agencies. The directors of the Student Association for the Study of Hallucinogens, Inc. (STASH)�a Wisconsin-based drug information resource center�approached Dr. Smith in June of 1970 with the idea of entering into a cooperative arrangement to publish the Journal of Psychedelic Drugs and to expand the periodical�s distribution. It was agreed that, beginning with Volume 3, Number 1(September 1970), the Journal�s publication, subscription, and general business offices would be moved to STASH headquarters in Beloit, Wisconsin. The editorial responsibility for the Journal�s content would alternate between the Haight-Ashbury Free Medical Clinic and STASH. This collaboration led to the successful expansion of the Journal in 1974 (Volume 6) to a regular quarterly schedule and the establishment of a professional Editorial Review Board to provide peer assessment in the selection of articles. To mark this occasion and to further delineate the scope of the Journal of Psychedelic Drugs, the subtitle �A Multidisciplinary Forum for the Study of the Drug Culture� was adopted. During the late 1970s the Journal of Psychedelic Drugs built an international reputation as a respected and authoritative periodical. This was corroborated by the inclusion of the Journal in the prestigious Index Medicus in 1979. In 1981 the Journal returned to its birthplace in the Haight-Ashbury district of San Francisco under the aegis of David E. Smith, M.D., Founder and Medical Director of the Haight-Ashbury Free Medical Clinics, and the continued editorship of E. Leif Zerkin, Cofounder and Codirector of STASH. At the same time, the Journal�s title was changed to the Journal of Psychoactive Drugs to better reflect the broad scope of its contents. In 1982, Jeffrey H. Novey joined the editorial staff as coeditor. After a distinguished editorial tenure of more than twenty years, Leif Zerkin moved on to other pursuits and new challenges. In October 1991, the responsibilities of managing editor passed to Jeffrey Novey. In December 1991, Terry Chambers joined the journal staff; she is now managing editor. In September 1996, Jeffrey Novey left to pursue further academic achievements and Richard B. Seymour, a long-term contributor to the Journal, became managing editor; he is now an editor. Throughout its forty year history, the Journal of Psychoactive Drugs has been on the leading edge of developments in the field of drug use, abuse, and treatment. It has consistently addressed the complex nature of substance use and abuse from a multidisciplinary perspective and has provided in-depth examination of a host of topics, including the disease concept of addiction, drug use and criminality, drug use and the elderly, drug use and sexual behavior, ethnographic drug research, the history of cocaine smoking, therapeutic communities, hallucinogens, stimulants, depressants, smokable drugs, drug dependence and the family, women and substance abuse, professional treatment and the 12-Step process, chemical dependence and AIDS, shamanism and altered states, dual diagnosis, psychotherapy/counseling, adverse effects of tobacco smoking, understanding and preventing relapse, substance abuse in the workplace, drug testing, methadone maintenance treatment, prescription drug issues, and culturally relevant substance abuse treatment. The Journal continues to serve both professionals and laypersons alike as an important multidisciplinary forum for critical thinking, analysis, innovation, and evolutionary development in the field of drug use, abuse, and treatment.